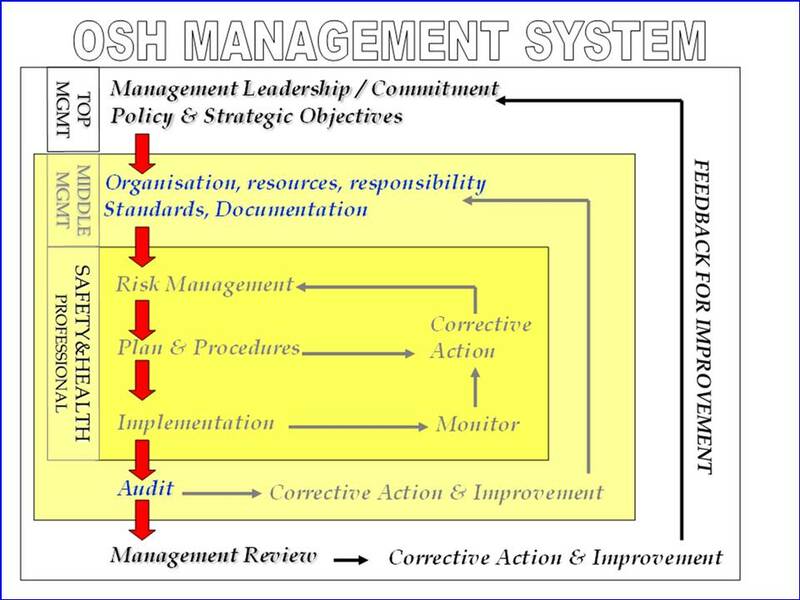 The Safety and Health Management System model below are one of the simple example of Safety and Health management model adopted by successful organisation. This organisation emphasize on the continual improvement of safety and health program in the workplace to ensure that the safety and health of the workers will be the priority in their business operations. The main component that will moves this Safety and Health Management System to be functional and effective is the Commitment from the Top Management. 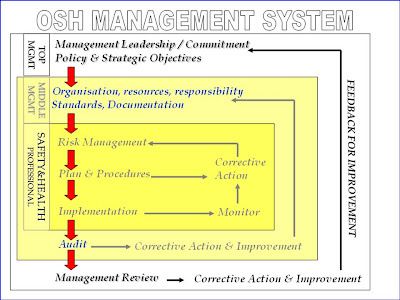 The overall responsibility to this systems lies on the shoulder of management team (both top and middle Management team). They have to ensure that all other components of the systems established in a systematic manner with a proper planning and implementation. They have to set the policy and objectives, employ resources, budget allocations, get the correct team and monitor the programs. The implementation of any program related to safety and health should be based on this management system so that it can be monitor and improved accordingly to ensure the safety and health of the workers is maintained. Audit and inspection is the tool that can be used by the management team to ensure the effectiveness and the quality of the program introduced . The professional groups in Safety and Health such as Safety and Health Officer, Occupational Health Doctor and Nurses, Industrial Hygienist, Toxicologist, etc. should be engaged by the management to assist them in establishing Safety and Health programs. The implemented programs should then be evaluated and improved.